Everyone who views these pictures closely will surely be drawn to something that touches a personal chord. There are, however, three additional categories or "patterns" in the recollections of the hibakusha that deserve to be singled out. One is the most universal of iconic images: the mother and child, here turned to tragedy. 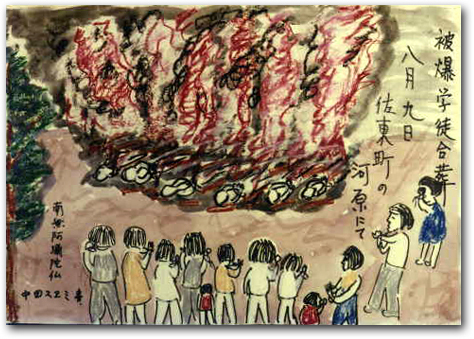 One is "the second fire," when survivors gathered to cremate the dead. 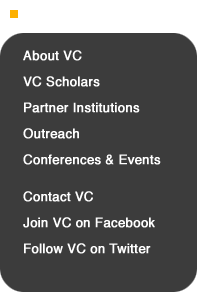 And the last is the most difficult question that can be asked of these visuals: can any hope be found here? Mother with child is, of course, our ubiquitous image of love. The survivors' pictures show us how, at Ground Zero, this was shattered is unbearable ways. 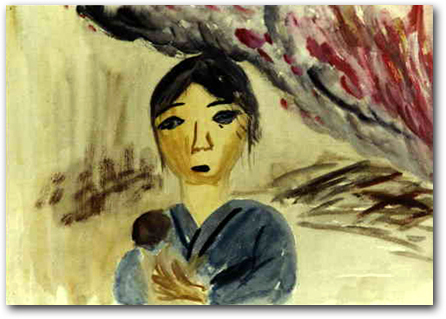 A mother clutching an infant against a background of fire may be a question posed (with no answer given by the artist in the form of accompanying text): will one or both survive? Has the rest of the family been lost? Mother with child running from the flames. Usually, however, the answer is clear. Mothers attempt to nurse dead babies, or carry a dead child on their back. Infants try to nurse at the breast of a dead or injured mother. 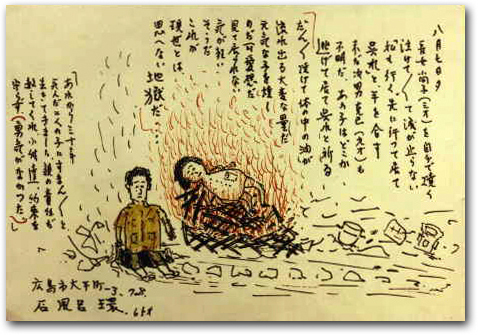 Charred corpses of a mother and child lie on the ground (often naked and usually with the mother above the child, as if caught in the final desperate attempt to offer protection). 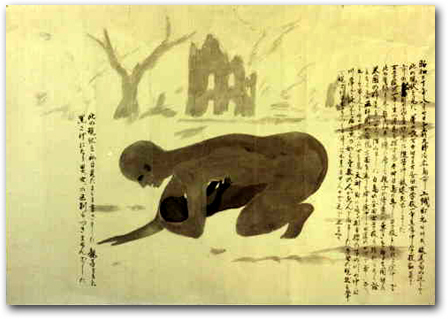 “Parent and child.” In the emotional text that accompanies this ink painting, the artist observed that the bodies were so charred that it was not possible to be sure of the gender of either corpse. 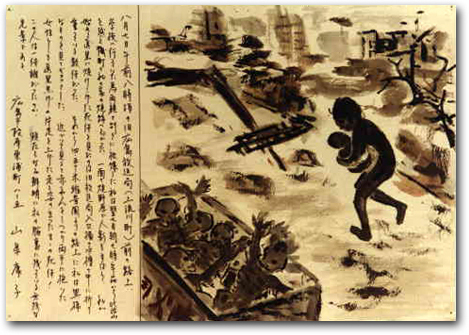 One astonishing ink painting depicts a scene in Hiroshima approximately 1.2 kilometers from the epicenter on the day after the bomb was dropped. Here the charred figure of a mother cradling a child still stands upright, poised in flight. The artist was 17 at the time. She had been at school when the bomb fell, and was making her way back to where her house had stood. The cruel sight was terrifying and unforgettable, she wrote in explaining her picture, and she wondered who the woman might have been. Mother cradling her baby. The artist encountered the still-standing charred figures the morning after the bomb was dropped, about 1,200 meters from the hypocenter. 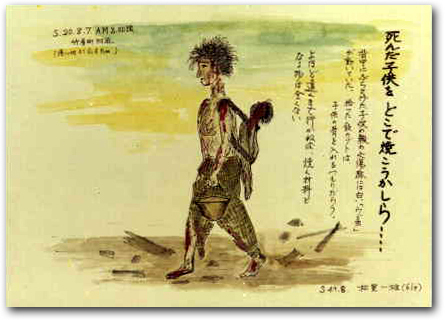 The "second fires," involving cremation of the dead, took place within a few days. Haste was essential to prevent the spread of disease, and as a consequence the dead were often seen off without formal services. Cremating Naoko. The artist’s lengthy text tells of the unspeakable agony of cremating his three-year-old daughter, and never finding the body of her older brother at all. He speaks of Hell, and of the guilt he has felt ever since for having failed to fulfill a parent’s responsibility to protect them. 30 years later, the final, unbearable, unforgettable fire some survivors depicted involved cremating their children or witnessing the collective cremation of classmates, neighbors, or kin. Group cremation of student victims of the bomb on August 9. The invocation to the Buddha of the Western Paradise recited by the mourners appears in the lower left-hand corner.